Just a month after it dethroned Microsoft as the third most valuable company by market capitalization, Amazon has done the same to Alphabet to become No. 2. Amazon has become the second most valuable publicly traded company in the world. The Seattle retailer on Tuesday topped Google parent Alphabet, landing for the first time in the No. 2 spot by the stock market’s reckoning, behind only Apple. Amazon’s move past the Mountain View, California-based search giant is the latest sign of the company’s rapid ascension in the last few years from an online retailer to a sprawling conglomerate with interests from business software to brick-and-mortar grocery retail and air transport. Read more on Seattle-based Amazon and its HQ2, second headquarters, plans. Three years ago, Amazon was ranked 34th by market capitalization, according to S&P Capital IQ. 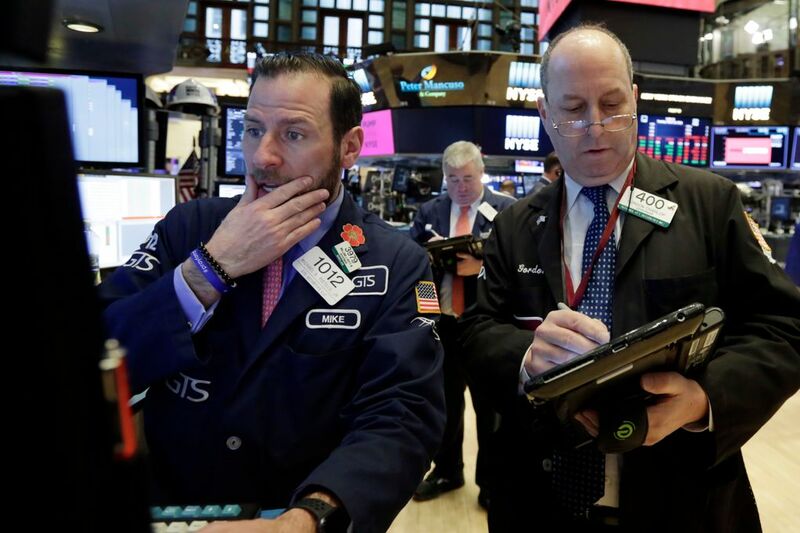 “It’s been remarkable the number of new, large markets that they’ve been able to open,” said Brent Thill, an analyst who tracks the company with Jefferies, an investment bank. Amazon shares climbed $41.58, or 2.7 percent, to $1,586.51 Tuesday, giving the company a market capitalization of about $768 billion. 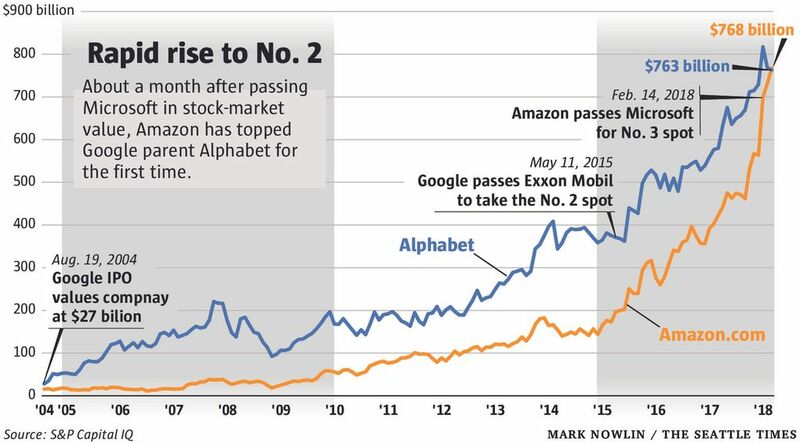 Alphabet, after falling $2.11, or 0.2 percent, to $1,097.71 a share, stood at about $763 billion. Apple was valued at $889 billion. Last month, Amazon’s stock-market value topped Seattle-area neighbor Microsoft for the first time. The Redmond company had a stock-market value of $717 billion on Tuesday. Amazon’s shares are up 36 percent this year, a rise that has made founder and Chief Executive Jeff Bezos the world’s wealthiest human. Bloomberg pegged his net worth at $132 billion, up $3.3 billion on Tuesday. Jefferies analyst Thill, who last week increased his price target on Amazon shares by 6 percent, to $1,850 a share, estimates that Amazon’s digital advertising business will grow rapidly in coming years, making the company a major player in a market dominated by Google and Facebook. He figures that the company’s advertising revenue stood at $4 billion last year and is on track to grow to $6 billion in 2018 and $9 billion in 2019. Amazon’s gain Tuesday came as shares of some other technology firms slid amid worries about regulatory crackdowns related to how big companies safeguard their users’ data. The news that Cambridge Analytica, a data-analysis firm hired by President Donald Trump’s campaign, had acquired Facebook user profile data on 50 million Americans without their permission sent shares of the social-networking giant down about 9 percent from Friday’s close — a loss of about $60 billion in market value for the company, and a $6.7 billion decline in CEO Mark Zuckerberg’s wealth, Bloomberg reported. Lawmakers in the U.S. and Britain have called for Zuckerberg to testify before them. Menlo Park, California-based Facebook — until late last year No. 5 in the world by market value — has ceded that position to Chinese internet conglomerate Tencent, which has a market cap of $560 billion, according to S&P Capital IQ.